Before wearing the ihram, it is sunnah to trim one’s nails, remove unwanted hair and make ghusl. If ghusl is not possible then wudu will be sufficient. Wearing of ihram should be done before entering meeqat. One piece of ihram is tied around the waist and the other thrown over the shoulders. Underwear, head covering (for males), shoes, socks are not permitted. Beach thongs or similar footwear that do not cover the arch of the foot (above the toes) and ankles are permissible. After wearing the ihram, perform two rakaat sunnatul ihram. In the first rakaah read: Surah Kafiroon In the second rakaah read Surah Ikhlaas. After the completion of this salah, make the niyyah (intention) of umrah, and recite the talbiyah thrice (Loudly for males, and softly for females). And say: O’ Allah, open for me the door of your mercies, and make easy for me the means of livelihood. Then recite: O’ Allah you are peace and from you comes peace. So keep us alive, our lord in peace. O’ Allah increase this house in dignity, honour, nobility and awe; and increase him who performs hajj or umrah in dignity, honour, and piety. You can make any other duaa to suit your needs as well If salaah time is at hand, do not start with your tawaf until after salaah. Remember that salaah will be performed bareheaded by males. Before commencing with tawaf, make a slight change in the top piece of ihram. Cover the left shoulder with one end of the ihram and pass the other end under the right arm, thus baring the right arm and shoulder and covering the left shoulder. This is called idtiba. Now reciting the talbiyah, proceed to the hajr-e-aswad, (black stone) which is at the corner of the Ka’bah closest to the door of the Ka’bah. A darkish brown line runs from the hajr-e-aswad till the end of the mataf (mataf is the open area for tawaf). It is easily visible as the mataf is of white marble. Above the line on the wall at the edge of the mataf is a green light which is directly in line with the hajr-e-aswad. The starting point of your tawaf is on this line, as close as possible to the hajr-e-aswad. 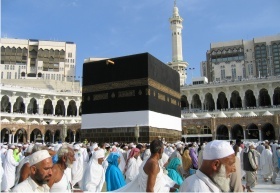 Before starting the tawaf, stand facing the Ka’bah with the brownish line on your right. Stop reciting the talbiyah and make your intention: O’ Allah I intend performing tawaf of your sacred house, (seven rounds) so make my tawaf easy for me and O’ Allah accept it from me.Now stand on the darkish brown line and face the hajr-e-aswad. Standing with the face and chest in line with the hajr-e -aswad, raise both hands as in salaah and recite the following: Bismilah allahu akbar, la ilaha illallah was lillahil hamd In the name of Allah – Allah is the greatest. There is none worthy of worship besides Allah and all praise belongs to Allah. While standing on the brown line, stretch your arms with the palms facing the hajr-e-aswad and then kiss your palms (as a substitute). [To kiss or touch the hajr-e-aswad is called istilam] If itr is on the hajr-e-aswad do not kiss or touch the hajr-e-aswad while in ihram .To kiss the stone is sunnah but to cause inconvenience and injury to others by pushing is haraam. Start moving towards your right and your tawaf has begun. For males the first three shawts (rounds) are to be done at a brisk pace with the chest out (this gesture is called ramal). The last four rounds at a normal walking pace. Engross yourself in dua and the third kalima while making tawaf. (Note: during tawaf do not face the Ka’bah with your chest. The Ka’bah should be on your left during tawaf. You will face the Ka’bah only when you are standing on the brown line to make istilam). The hatim has to be encircled as well. The tawaf will be incomplete. If one passes through the hatim. (The hatim is the area with a low, half circle shaped marble wall close to the Ka’bah. Everytime you circle the Ka’bah touch the rukn-yamani (the yamani corner) with your hands or the right hand, as this is mustahab. Do not kiss or place your forehead against it. If you are unable to touch it, move on (without raising the hands). Every time you reach the hajr-aswad, if possible kiss it, otherwise while standing on the brown line raise your right hand with palm facing the hajr-e-aswad. Duaa should be recited softly, keeping the meanings in mind. Loud recital of duaa is makrooh. Remember it is better to read a dua in the language you understand. There are no fixed duaa for each round. You are at liberty to recite anything to suit your personal needs. We include certain selected duaa rasullah (sallalahu alaihi wasallam) and the sahabah (r.a.) Subhanallahi wal hamdu lillahi wa lailahi illallah wallahu akbar wa la hawla wa la quwwata ilala billahil aliyyil azim Glory be to Allah. All praise be to Allah. Allah is the greatest. There is no power and might except from Allah, the most high, the great. This was the most recited duaa in tawaf by Rasulullah (sallallahu alaihi wasallam) and the sahabah (r.a.). Rabbana Aatina fiddunya Hasanah wa fil akhirsti hasanah wa qina azaban naar. Our lord grant us good in the world and in the hereafter and save us from the fire hell). Your tawaf will be completed after seven rounds (you have made istilam 8 times). When directly in line with the mizab (a water drain from roof) recite: O’ Allah I ask you for forgiveness and safety in the world and in the hereafter . Our lord, grant us good in the world and in the hereafter and save us from the fire (hell)Go to multazim (an area between the Ka’bah door and hajr-e-aswad) and make dua to your hearts desire seeking Allah’s grace and mercy. If possible place your chest against the wall of the Ka’bah, hands raised and right cheek touching the wall. Thereafter, if it is not makrooh time for salaah, go behind the maqam ibrahim. If there is no space behind the maqam ibrahim then any other place in the haram will suffice. Cover both shoulders and perform 2 rakaat salaah. These 2 rakaat are wajib (wajibut-tawaf) and themustahab suras are kafiroon and ikhlaas . Next go downstairs to the well of zam-zam and drink to your fill. Before drinking say: “bismillah” and after drinking say” alhamdulillah”. Duaa near the zam-zam well are accepted so make dua there as well. The well is visible with a glass partition blocking entry to it (in the male section). The dua of rasulullah (sallallahu alaihi wasallam) at the time of drinking zam-zam is as follows: O’ Allah I am asking you for beneficial knowledge and extensive sustenance and a cure from all ills. La ilaha illalah and Allahu akbar and then read durood sharif (softly). Descend from the slope and proceed towards Marwah staying to your right side of the area. About 230 feet (70 meters) from Safa are two sets of green fluorescent lights indicating the milain akhdarain. Males have to break out into a slow jog between these lights, a distance of about 160 feet (50 metres). It is sunnah to jog or run this short distance. Engage yourself with dua and zikr and repeatedly recite.On reaching marwah, climb the slope, face the Ka’bah and do the same as you had done at safa. (The Ka’bah is not visible from Marwah). One shawt has now been completed. Commence your return to Safa .On reaching the green light breaks out into a slow jog again till you reach the other green light. On reaching Safa, the same procedure of reciting the duaa is carried out. The second shawt has now been completed. In this manner complete seven shawts ending at Marwah. After completing the seven rounds, return to the mataf area of the haram (i.e. the open area around the Ka’bah ) and perform two rakaat salaah (mustahab). Thereafter, go to the barber and have your hair shaven off (male only). Women will trim the end of the hair (approx: 1 inch or 2.5 cm). The best way is for her mahram (after he has shaven off his hair) to wrap the end of her hair once around his finger and snip off the amount mentioned above.